Located in the northern side of Jammu & Kashmir, Ladakh covers an area of 97,000 sq kms and has an average elevation of 3,500 meters from sea level. Often tagged as ‘Snow Desert’ of India or even ‘Little Tibet’, this Himalayan kingdom has a lot to offer to every traveller. Due to its rigid climatic conditions and other features, you should take certain necessary precautions before planning your Leh-Ladakh tour. While planning your trip, acclimatization to the changing climate and heights is one of the most vital aspects. Thus, ensure that you are in your best physical health. Also, due to the considerable elevation from sea level, ensure that you carry a simple pullover for the day time and a warmer jacket for the night time as the mercury can drop to zero or below. For accommodation, there is not much in Ladakh except one luxury hotel in Leh town. So be ready to live in campsites, tents, homestays, smaller hotels and many other budget overnight stay options. The good news this year is that Indian travellers don’t require any inner line permits to visit areas like Turtuk, Panamik, Khaltse, Pangong, Changthang, Hunder, Nubra Valley Tso Kar, Tso Moriri and surrounding region. However, do carry your national identity proof which will have to be presented at certain check posts. Isolated landscapes, rough mountain terrains and breadth-taking views in every corner of Ladakh are common sights. It’s amazing to see how the locals are still steeped in ancient tradition and beliefs. There is so much to explore in Ladakh that without proper guidance, you are sure to miss out on so many of those OMG moments. To ensure that you live all those moments and come back with tons of memories of your trip, jot down the attractions you want to visit depending on your preferences, budget, choice and number of days in Ladakh. Once you are sure about the destinations you want to visit, plan your itinerary accordingly. 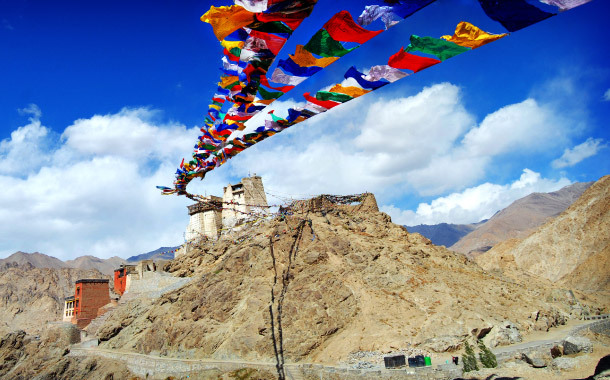 Below are the few must-see, must-do in Ladakh. Leh, the erstwhile capital of the kingdom of Ladakh is a dream destination of many travellers and the Mecca of adventure enthusiasts. It is one of the coldest deserts of the world and is popular for its heritage, villages, and the ruins of The Royal Palace (locally known as Leh Palace). Do visit the famous Shanti Stupa monastery and Leh Palace. If you are going on a backpack trip, head to Changspa which is popular as a back-packers hub. Famed by the popular Bollywood movie – ‘3 Idiots’, Pangong Tso Lake is a 4-5 hour drive from Leh and is situated at a height of 13,900 ft. The first glimpse of the serene, bright blue waters and rocky lakeshore will remain etched in your memory for a lifetime. Interestingly, one third of the lake is in India while the remaining two third lies in Tibet, which is controlled by China. You must opt for a camping experience near the lake for a beautiful view. You will witness the chameleonic effect of the sunlight on the lake from dawn till dusk. If you are lucky, you can also catch a glimpse of ducks and often some crustaceans on the shore of the lake. Located in the upper parts of the Indus Valley, Shey was once the summer capital of Ladakh. It is primarily famous for the Summer Palace of the kings of Ladakh. The Palace, built about 555 years ago, is today home to the largest, gold plated statue of Buddha in Ladakh. Shey also houses the famous Druk White Lotus School which was one of the locations in the ‘3 Idiots’ movie. Described as a piece of heaven on earth, Tso Moriri is picturesquely situated in secluded Rupshu Valley. Located about 250 kms from Leh, the region houses the popular saltwater Tso Moriri Lake. Flanked by lofty mountains, this serene lake and the area around it attracts a range of wildlife including migratory birds, wild asses, marmots and often Tibetan wolves. You can easily spot nomadic herders of cows, yaks and goats who live in the lake’s vicinity. A perfect location for nature lovers, Nubra Valley is also known as the ‘Valley of flowers’. Located at an altitude of 10,000 ft. above the sea-level, this valley can be reached through the Khardong La pass. You can also traverse Wari La from Sakti region. The famous Siachen glacier lies to the north side of the valley and is well connected with Xinjiang (China) through the Karakoram Pass. Do try the Bactrian camel ride along the sand dunes leading up to the Deskit and Samstanling monasteries. If time permits, take a visit to Yarab Tso, a holy lake located near Sumur village. Khardung La is considered as a mecca of motorcycling enthusiasts located about 50 kms away from Leh. To ride up to 18,380 feet and stand on one of the highest motorable roads in the world is a lifetime experience. Khardungla is about 60-80 minutes one way from Leh if you drive without any stops. If you want a long day trip, then you can continue towards Nubra valley, which is located on the other side. Popular for its Tibetan Buddhist monasteries, jaw-dropping landscapes and Tibetan culture; Ladakh is a perfect heaven for travellers looking for more than just a break from the routine life. So get ready to stay captivated with its beauty and plan a trip to Ladakh now.